Often known as the Weimaraner Vostehhund, the Grey Ghost, the Greydog, and the Weimar Pointer, the Weimaraner is a younger breed of dog that only traces back to the 1800s. Known for the glamorous, distinctive grey coat and incredible hunting skills, the breed offers a combination of tracking gundog, pointing, and retriever skills, not to mention, it’s an excellent family pet. 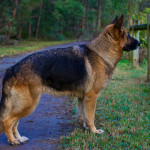 The well balanced dog is usually elegant and reserved, and this breed learns very quickly. Although the AKC doesn’t currently recognize long-haired Weimaraners, they do exist and they are recognized in other parts of the world. 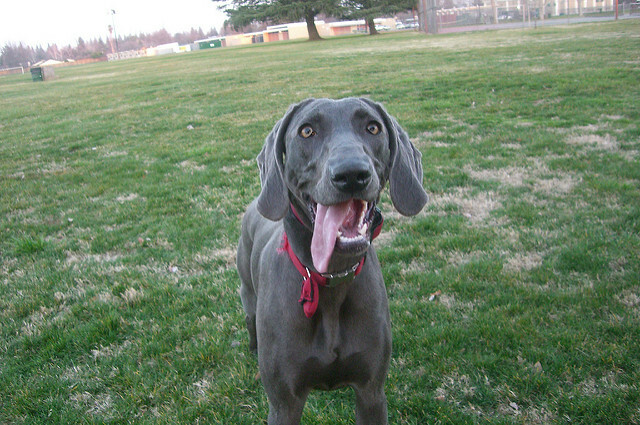 The Weimaraners we have today took many years of selective, careful breeding. Historians believe that the Bloodhound was probably one of the many ancestors of the Weimaraner, although this breed probably shares ancestors with many other German hunting dogs, such as the German Shorthaired Pointer. 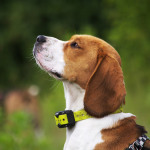 Another theory is that these dogs may have descended from the German Braken, or perhaps they came from crossings made between several unnamed pointers. 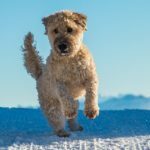 Although the precise ancestry of these dogs is unclear, it’s thought that they were developed in their pure form by the early 1800s. 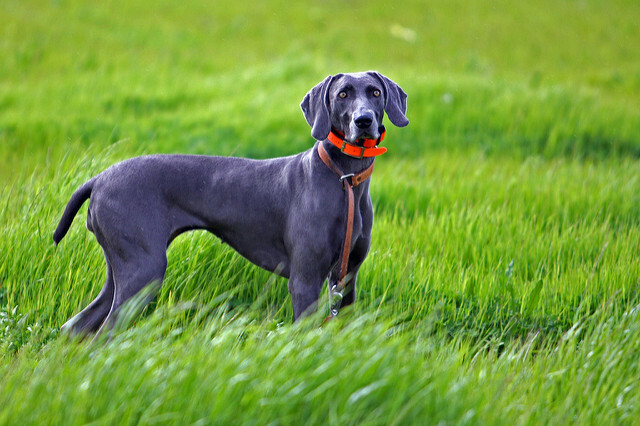 Early in the development of the Weimaraner breed, these dogs were used by sportsmen to hunt various types of big game, such as board, wolf, bobcat, mountain lion, bear, and deer. 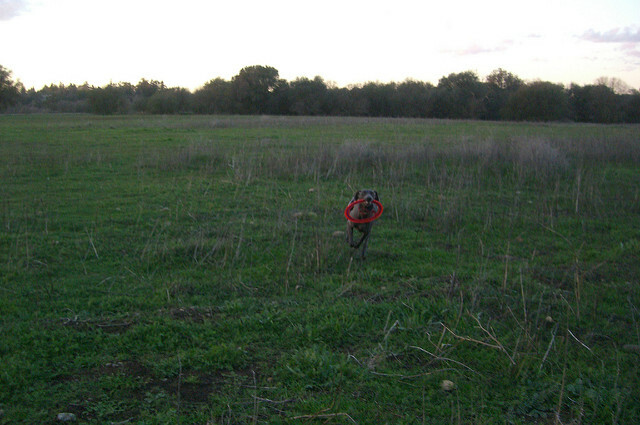 During that time enthusiasts of the breed were very wealthy, hunting for sport instead of need or profit. This breed was considered a rich man’s dog at the time, and the Weimaraner Club of German was first formed in 1897 to help protect this breed, preventing “commoners” from acquiring the breed. At this point, it became very difficult for most Germans and individuals in other countries to obtain one of these dogs, since the Club came up with strict rules about who was able to purchase and own Weimaraner puppies. 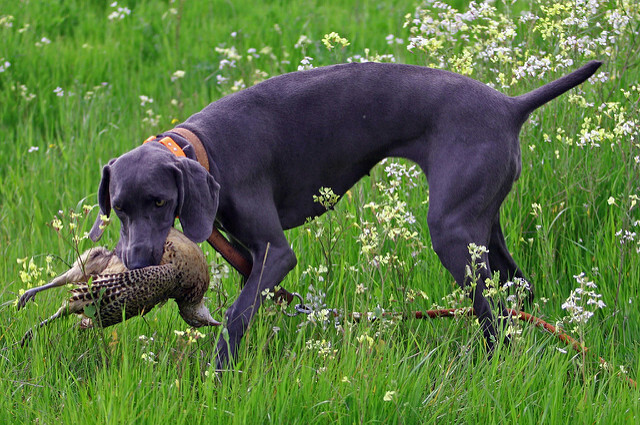 Soon the big game in Germany started to dwindle away, so Weimaraners were used to help flush out and retrieve various land game birds, as well as to help retrieve waterfowl from streams and lakes. 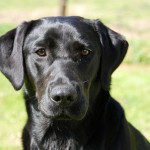 They become well known for their incredibly soft mouth, which did not injure the birds they retrieved. 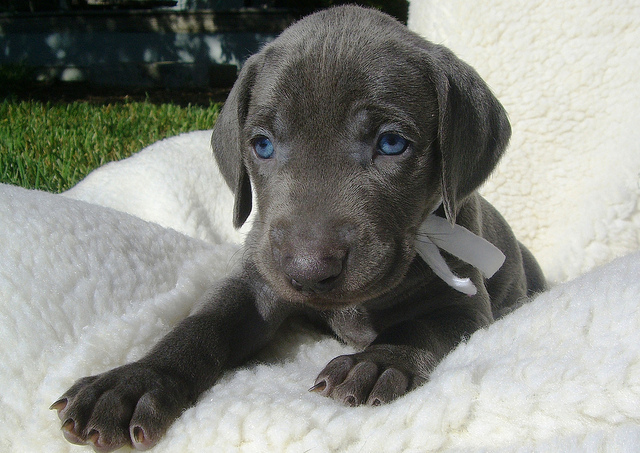 Later Howard Knight would be permitted to join the Weimaraner Cub in Germany and he was able to import two of these dogs, although the German breeders had sterilized the pair to prevent breeding. 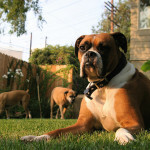 After years of work, he was able to acquire breeding stock and he started breeding. Eventually he was very instrumental of getting the first Weimaraner club founded within the United States. Finally, the AKC recognized the Weimaraner in 1943 as part of the Sporting Group. Males generally stand between 25 and 27 inches at their shoulder, while females are a bit smaller, usually standing between 23 and 25 inches. The males usually weight in at 75-85 pounds, while females are lighter at 55-70 pounds. 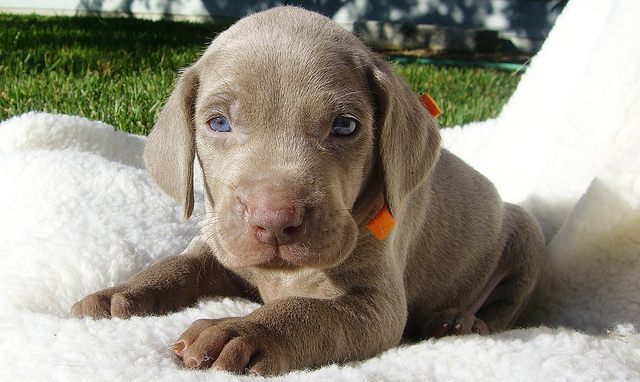 The Weimaraner should have a solid color, smooth, short coat, which can range from silver gray to mouse gray. 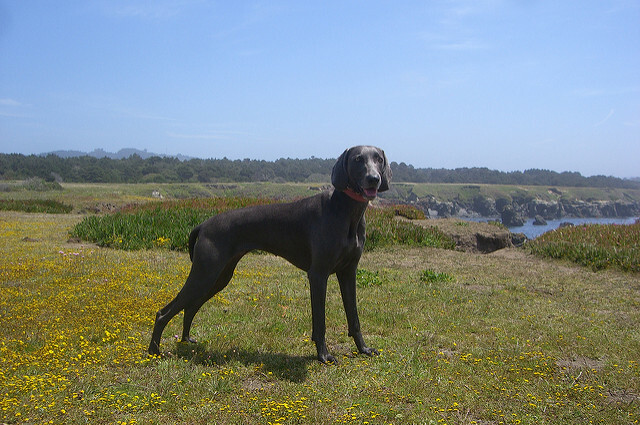 Within the United States, the AKC does not recognize long-haired Weimaraners, so these dogs are rare within North America. However, long-haired Weimaraners do exist within Europe and are recognized there are local kennel clubs. 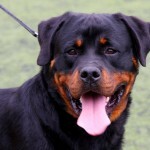 These energetic, highly athletic dogs happen to come with plenty of elegance and energy. 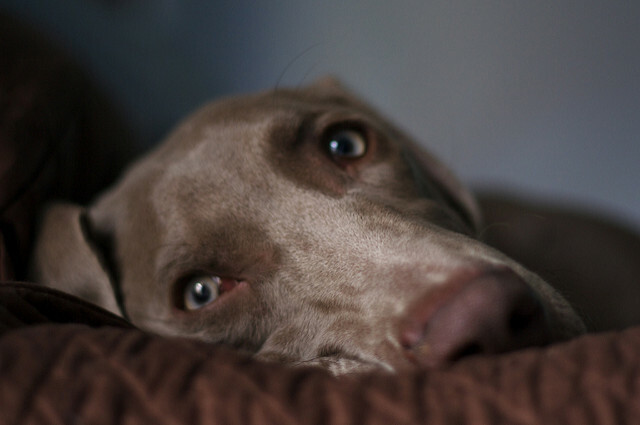 However, no matter how cute Weimaraners may look, they aren’t for everyone because they are demanding and require a lot of exercise and strong leadership to keep their temperament even. 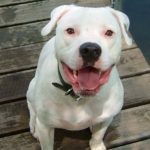 While they require a lot of time outdoors and are very active, they like living indoors with the rest of the family and enjoy plenty of affection. 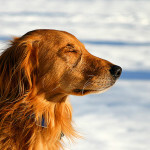 These dogs are great companions for outdoor families that have a lot of experience working with dogs. 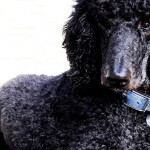 This breed can be quite the handful to train, since they are mischievous and stubborn. If they get bored, they’ll walk away from the activity. It’s important to start Weimaraners out young with training so leadership is quickly established. Use plenty of treats and praise when training, but it’s also essential to use confidence. Avoid harsh discipline, since this will make a Weimaraner completely disregard you, so it’s important to have plenty of patience when training this breed. Since the Weimaraners have a short coat, they usually don’t require a lot of grooming. 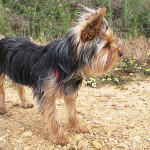 They have a dirt repellant coat, and simply brushing them once a week helps to keep their skin and coat nice and healthy. While they do shed throughout the year, a regular brushing will ensure that loose hair is kept under control. To make the coat shine, simply wipe down the coat using a chamois. They only need to be bathed as needed. 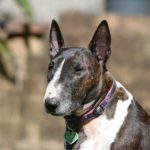 Their ears should be checked each week for wax buildup, irritation, or infection, particularly since their pendant ears don’t allow for much circulation of air to the area. Teeth also need to be brushed weekly to avoid problems with gum disease and tartar buildup. The Weimaraner was originally bred to be a working dog, bred to be a hunter of big game, and later of birds. Today they are often used for hunting purposes, although they are very popular as faithful pets as well. 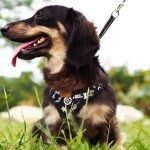 Looking for a Weimaraner and Dachshund mix puppy breeder. Any information on where i can find one? 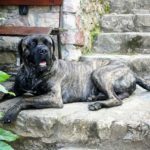 You could try and find online advertising platforms in your country where people can put up their mixed puppies for sale.